Well, now it’s here, and by the time you receive this email, things could have gone very, very wrong, indeed. Or, perhaps not. We now know of at least one more confirmed case of Ebola, a nurse who had been attending the infamous Liberian patient, Thomas Eric Duncan. If we’re lucky, that will be as far as the virus spreads. Another possibility is that the Ebola hype has died and another potential pandemic is on the horizon. I originally sent this article to my newsletter subscribers but I’ve received so much positive feedback that I wanted to share it on the blog as well. I do send out exclusive articles to my subscribers, and you can sign up for these here. 1. If you’re prepared, in general, you’re already prepared for Ebola or any other outbreak. Almost. Be reassured that you have many survival pieces in place and are way ahead of the game, if the worst should happen. Now it’s just a matter of adding some additional supplies and making a few, new plans. Just in case. Heavy duty trash bags. These will serve a multitude of purposes, but this story about a woman in Liberia who was able to treat her family members with little more protection than a raincoat, rainboots, and trash bags is inspiring and shows the need for this basic supply. Multiple pairs of Nitrile gloves. They’re inexpensive, so stock up.They’ll come in handy for far more than Ebola. Face masks. Read this article for more details, but a respirator is highly recommended. The ReadiMask is a good, inexpensive option, but the most recent reports seem to indicate that nothing short of a respirator is the best choice in an Ebola hot zone. Safety goggles. If you ever have the misfortune to be in the presence of an Ebola patient, every bit of skin should be covered. You’ll need safety goggles to protect your eyes and the skin around them. Several gallons of bleach. If you know how to use calcium hypochlorite to make your own bleach, that’s a better option, but it’s also more of a challenge to get the chlorine at a safe level. Hand sanitizer in every possible form and plenty of soap. Here’s a big word of warning. We’re seeing healthcare workers who have worn professional, protective gear become infected with this virus. In no way am I suggesting that the supplies on this list will keep you safe if you are face to face with an Ebola patient. Until we know more about how the virus is transmitted, and I don’t believe even our most expert experts know for sure, the best course of action is to avoid any known areas with the infection. 3. Begin thinking about hunkering down, in place, for weeks or possibly months. If any pandemic grabs a foothold in your area, say within 100 miles, you won’t be able to go to work, the kids will stay home from school, even going out to buy groceries or other necessities may be too dangerous. What should you have on hand in this case? Could you begin homeschooling your kids? Do you have cash on hand, rather than just in the bank? Read The Jakarta Pandemic for some practical tips. 4. Keep track of news from multiple sources. Information coming from the CDC is scary, not reassuring, and they are supposed to be the ultimate source for controlling disease. On the other hand, some voices on the internet are screaming that it’s all over and we’re doomed. Read everything you can and assess information from multiple sources. 5. If now is the time to panic, you absolutely must not panic! This is the time to assess your preps, get the facts and the latest information. Prepare to hunker down or pack up what you can and head for a part of the country that remains unaffected. Thinking clearly and making logical plans will be your 2 best survival preps. Having said that, if a particular website or radio host or friend is a source of nothing but negative, doomsday information and you find yourself swallowed up in it, avoid them. Just a friendly tip from Survival Mom! 6. At this point, normalcy bias could be your worst enemy. I never dreamed that you and I would be talking about EBOLA in AMERICA, yet here we are. There’s no point in trying to take comfort in, “It’s just one guy in Dallas.” That’s normalcy bias talking. If the virus made it this far, it’s likely to pop up again, and again. That could be our new reality. Hiding behind, “It couldn’t happen here…” is the least helpful thing you can do. 7. Work hard to become as healthy as you possibly can be. It doesn’t appear as though Ebola’s effects are more profound against the unhealthy, aged, and/or weak, but Ebola isn’t the only potential pandemic on the horizon. Build your immune system by paying attention to your body, first and foremost. When you’re tired, rest, and get plenty of sleep. Spend time outdoors in the sun and nature. Eliminate sugar and processed foods from your diet as much as possible. Strengthen your muscles and overall stamina through regular exercise. 8. Introduce any changes to your family routine slowly and matter of factly. Scaring kids with horrific tales of Ebola or any other disease and its effects will only instill panic. Being a bit more cautious than usual around sick family and friends, taking some time off from school when flu reports become widespread, teaching kids to wash their hands more frequently — none of these are wild-eyed, tinfoil hat responses! They make sense and when you have a low-key explanation, kids will cope just fine. 9. Be prepared to take action before officials give the go-ahead. Officials at all levels, including school districts, fear nothing more than panicked citizens. When a large number of people panic, they begin to take actions of their own. This might take the form of demanding accountability from individuals and agencies or it could take the form of riots or worse. Try to stay one step ahead by getting your information from multiple sources. If you have friends or family in the medical field or in government agencies, ask for insider information. 10. Continue to enjoy life. Make plans for holidays and birthdays. Go ahead and try to lose those last 15 pounds! We’ve seen good times and bad times come and go, but what keeps us steady and sane are the little things in life that aren’t so little — family, faith, friends. In the stories coming from the Ebola hot zones, there’s something that comes up over and over: family bonds and traditions. It’s important that we keep those going in our own homes and communities. Great list. What worries me with Ebola is how we keep hearing how hard it is to transmit the disease, but how easily it seems to be caught. I know our hospitals are some of the best in the world but people are still human and they make mistakes. Just one mistake can put many people at risk for Ebola. As unfair as it may be we need to quarantine all people coming back to the US from Africa for the 21 days it takes regardless of what symptoms they arrive with. We quarantined immigrants years ago for public safety. It just makes common sense. Ebola is transmitted from droplets so a simple hand shake of an infected person and then wiping your eyes could transmit the virus. To me that’s way to easy to get. It’s not like HIV where in most cases you really have to put yourself at risk to get the disease. Plus flu season starting soon there will be a lot of misdiagnosis and rural health clinics and hospitals are NOT ready! Love the verse you quoted too! As a former microbiologist obsessed with Ebola since 1999, it really still isn’t all that easy to catch. Should you be worried? yes, but we are not yet looking at it being as easily transmitted as many other diseases in America. that said, I wouldn’t trust our government to tell the truth about what is really happened, so definitely be prepared. Hand Sanitizer will do nothing against Ebola. Ebola is a virus, and hand sanitizer’s are for bacteria. Better to have bleach and bar soap. Bleach will sanitize and frequent hand washing is key. The alcohol component of hand sanitizer CAN be effective against both viruses and bacteria, but it’s not guaranteed. Some commercial hand sanitizers contain less alcohol than others, which has led the FDA to caution against relying on hand sanitizers. The best method is hand washing or a bleach solution, but if that’s not available, hand sanitizer (if available) should be used. It’s also a good back up to hand washing. Thank you for sharing that information with us. Sometimes we forget about the little things that our kids will need besides food, shelter, and hydration. Thankfully I’ve been a follower of you and several other prepper sites and this has helped me with my 2, 3, and 12 yr olds bug out bags and just being prepared at home as well. Coloring books, new story books they’ve never read, some puzzle books, flash cards, bibles for each child (pocket bibles),the next year of schooling in books (we do home school) paper pencils, colors etc.. Each bug out bag also has a replica of their favorite toy, this way if we have to leave in a split second for what ever reason, we have their toy and it will always be with them. We also have our stash of our first aid kit in Essential Oils (only 100% pure therapeutic grade) & Holistic supplements from our Naturopath, that we rotate as taken to make sure they don’t expire. False. The alcohol in hand sanitizers denatures proteins. Since all virions have a protein coat, hand sanitizer does work against virus particles. ‘70%-90% ethyl alcohol hand sanitizer destroys lipid enveloped viruses like ebola very easily if the organic soiling is not present’-this is directly from an ebola fact sheet from Kimberly-Clark health ebola precautions sheet dated Sept 2014. So it would be prudent to keep some 70-90% ethyl alcohol hand sanitizer on hand. if things such as hand sanitizers won’t kill viruses, and I’m not arguing that point, then why do they say to use them to help stop the spread of colds and flu? If you want to see how quickly something can spread watch the movie Contagion. and, as a side thought, if you are ill or your immune system is compromised in any way, unfortunately a hospital is the last place you want to be. I have heard that echoed by too many nurses over the years to count. YES! This is very much along the lines of what I tell people, especially when I can tell fear is grabbing hold of them. I’m telling family and close friends to stock up and get prepared for possible quarantine of 6-12 weeks. The number one thing I tell them is to stay out of areas with known cases. Glad to see you give the same advice. I’ve also told them if it comes to within 100 miles of our community we are battening down. Too many people are careless and don’t even think about washing their hands after using the bathroom.Imagine how much worse it will be when they have to wash their hands a lot, lot, LOT and for at least thirty seconds of good rubbing and scrubbing! First people need to be aware of the FACTS on how Ebola is transmitted.It is transmitted by close contact with bodily fluids, specifically, feces, blood, vomit, saliva and possibly sweat.When I mention saliva,that does not mean coughing or sneezing…Ebola is NOT airborne.Ebola has an R0 of R2(same as Hepatitis C and less than HIV), Measles has an R0 of R18(http://www.npr.org/blogs/health/2014/10/02/352983774/no-seriously-how-contagious-is-ebola)Yes Ebola is scary, but we don’t need to worry about Hollywood-like pandemic scenarios.Ebola is classed as a “caregivers” disease, those taking care of patients, not the general public are at greatest risk. Here are some facts about Ebola. http://www.vox.com/cards/ebola-facts-you-need-to-know/what-is-the-ebola-virus One of the biggest problems with this disease is misinformation. “Airborne” is a matter of semantics. Great article! I do remember that story about the woman in Africa who treated her family with the use of everyday supplies, most memorably being the trash bags like you mentioned. Survival isn’t about having all the flashy high tech gear. Sometimes it’s the stuff you don’t even think about that can save you. Again, great write up about this horrendous disease. Well we get cases here, yes…but according to those who really know and understand this disease(those that have studied it) they will be pretty much self limiting. Condescension to toward me, my writers, and readers isn’t going to get you very far here, Trish. Or whatever your name is. The CDC is on record telling healthcare workers to avoid public transportation. If Ebola is that difficult to contract, then what’s the harm in taking a bus ride here or there? Americans ARE upset and angry that even a single case of Ebola came to America. What I see and hear is far more ANGER than hysteria and fear. American citizens want answers. I believe they will start demanding those answers of their elected officials, and maybe that’s what you’re afraid of. While I am in no way scared or afraid of the situations that are going on right now in America, I do know that officials are backing up on what we were told the past few weeks. First there was very little chance that Ebola could make it to the states…well it’s here. Then there were only 4 hospitals that were equipped for Ebola. Now every hospital is capable. It’s one misinformation after another. Trish, your Facts might be written down on the CDC website or WHO, and they can claim to be experts on the subject, and as far as I am concerned they are. However, it is becoming more apparent that it is possible that they do not know exactly how it can be contracted(I’m pointing out here sneezing on a person). I will take caution on my side and I would suggest everyone else and be READY just in case something does happen. Great article! I agree, Rob. The NIH and CDC, in particular, have done nothing to inspire confidence, and they’re supposed to be the ultimate when it comes to knowing all there is to know about something like Ebola. Why some people, Trish included, seem intent on parroting a single line of information as an irrefutable fact, is a little odd. If nothing else, it’s obvious that Ebola, at least this particular strain, has some secrets yet to be discovered. Will the Ebola crisis here become as terrible as it in Africa? I pray it does not. But just because we are a “developed western world” doesn’t mean we are protected. People “that have studied it” and who are a part of our health care system right now are speaking out about the danger we WILL face if we don’t do something to prevent Ebola from getting a foothold in the US. So if the hospitals are not prepared for a pandemic response, we then cannot count of our “great healthcare system” to prevent a pandemic. The head of the CDC also said today that we must be prepared for more health care workers to get sick with Ebola… even though two weeks ago he said that any hospital that can do isolation can prevent the transmission of Ebola to health care workers. A group of German medical doctors in a peer-reviewed medical journal article published by Oxford University Press have challenged a key assumption regarding the Ebola virus repeatedly asserted by Dr. Thomas Frieden, director of the Centers for Disease Control and Prevention in Atlanta. The researchers found that a patient showing no symptoms of the disease can still transmit a virus like Ebola by air if droplets containing the virus are transmitted to another person by a sneeze or cough. The biggest issue with Ebola is the question of exactly when a person becomes contagious. The claim has been made in comments above that by the time a person is contagious he or she is so sick they are unlikely to be out and about. This is just not true. Though the symptoms are described as “sudden onset” we don’t know EXACTLY when the person becomes contagious. The woman’s dull headache that lasts a couple hours and her husband sends her to bed to rest with a kiss? That first sneeze that ends up unintentionally spraying another person who then puts their hand on their food to eat without washing? We just don’t know when it starts. To say that a person will know when they are contagious assumes they know they have been infected. They might not. From the Mayo Clinic… “Infected people typically don’t become contagious until they develop symptoms.” See that word? TYPICALLY. Sorry, that’s not reassuring to me at all. In addition, “some of the worst Ebola epidemics have occurred because contaminated injection equipment wasn’t sterilized between uses…” and “Ebolavirus can remain viable on solid surfaces, with concentrations falling slowly over several days.” This means it CAN live on surfaces outside of the body for a period of time… especially if blood is involved. One would likely notice blood on a surface, but if one drop of blood has enough of the virus to kill hundreds of thousands… again, not reassuring. With flu season coming, it is possible that people may assume they are catching a cold or flu and head to a store for meds, continue to go to work, etc. They could be in the early stages of Ebola and not realize it. Nowhere did I see that nasal discharge of a sick person must contain any blood to transmit the disease. It isn’t just people flying into the country via airlines that we have to worry about. Our Southern border is porous. We all know that. There is the possibility that it can walk right into the country, potentially contaminating many people along the way. There have already been groups of Liberian men caught in Central America on their way to be smuggled into the US. Do you think they will go right away, before symptoms, to get medical attention for possible Ebola infection? How hard will it be to identify and isolate everyone that these people would have contact with during their illegal entry? And the infected people… do you think when they get a fever and a cough will realize that it’s something more than the flu and not spread it inadvertently? If you believe that, you are far too naive. Of course there is also the possibility of an INTENTIONAL infection of others… it doesn’t even have to be “weaponized.” We already know from previous information that our hospitals are likely not ready for a pandemic level outbreak. Something else that is concerning… the restrictions in Liberia on what the media is allowed to report. Any time the government restricts the press it is to protect the government and withhold true information from citizens. What are they trying to hide? If our government (especially of late, but not limited to the current administration) had any credibility in their ability to handle a crisis well, I might be more comforted by their assurances. But they have proven that the information they release is more related to public opinion polls and CYA than what the citizenry should be told. If ebola doesn’t concern you, then great. Move on. But I think it does a disservice to others to completely dismiss and/or criticize the concern that others have about it. There is not enough definitive information known about how this virus spreads (what exactly constitutes “contagious only once symptoms develop”) or the risks of it mutating to something more contagious. I would rather be overly concerned and cautious and watchful than to dismiss it altogether. Again, I pray it turns out to be nothing and the word “ebola” quickly leaves our news cycle because it has died out. But the reality is… of all the disasters that *could* happen in our world, there are some that are much less likely (zombie apocalypse) and some that WILL absolutely happen again at some point… pandemic. Whether that pandemic is from ebola or another disease remains to be seen. Wow. That’s quite a collection of sources! I’ve become very skeptical of those who are yelling, “It’s not AIRBORNE,” when it’s obvious there is something very, very wrong with this particular outbreak. I don’t know what their motivation is, nor why they are so bothered by someone questioning how Ebola is transmitted, but your response is a far more sane outlook. BTW, InSANEMom is the typical Survival Mom reader. Obviously, she’s working hard to stay informed. She doesn’t come across as “hysterical” by any means. Just smart. “the standard test for diagnosing Ebola is the PCR, which has many flaws that render it misleading and useless. All I can say in regards to prepping for Ebola and other life-threatening scenarios is this: I’d rather be overly cautious and prepared than not. The fact remains that we do not know FOR SURE how this virus spreads, at what point it’s contagious and how many are affected and I am not willing to risk my life or the lives of my family and loved ones to find out. I think this article is good general information of how to be prepared for any crisis, but as a healthcare professional, I worry that this just plays into the hands of the media who have already created a monster with all of the Ebola hype. There are many more things you should be worried about catching, but of course the media does not tell you that. Thousands of children have died from pertussis and it is very contagious, is the media striking that fear into our hearts? Measles is on the rise…. Do you hear about that? Enterovirus D 68 and RSV are affecting young children in general. I’ve seen children die in the hospital from RSV. These things are much more likely to impact your life than Ebola. Stay informed, be prepared, yes… But keep it in perspective. I wish the media would give pertussis as much attention. Maybe I wouldn’t have to watch yet another baby die of something that really is preventable. You have way bigger things to worry about… Ebola is far down the list. I agree completely. I think with Ebola there are a couple of issues going on that makes it different from other, more common viruses. First, it’s a horrific, worst case scenario disease for which there is no cure, and the fact that it’s in America to begin with is unsettling. Second, based on what we’ve seen with the first 2 cases, our very, very best health agencies are nowhere near ready to deal with it, and that’s quite humbling. And scary. The experts say one thing and then backtrack the next day. Third, in spite of protestations otherwise, no one can say for sure exactly how it’s passed from one person to another, or why one person gets it and another doesn’t. Enterovirus D68 is frightening but doesn’t fall into the same horrifying category as Ebola, which is probably one reason why it’s been downplayed. As well, suspicions that it arrived along with the flood of illegal immigrants crossing the border isn’t exactly politically correct. On another hand, I noticed Clorox stock is up lately. Someone must be paying attention to us. My husband and I have been reading Psalms 91 ( it’s all about divine protection ) the entire chapter every night … I have heard of many miracles of protection for those who pray this Psalm over their family… God Bless us and protect us all . Thanks Survival Mom , you have given very sound advice here and I will share will my children , family and friends . Also all my groups on FB. Blessings to us all !! So are all the 8 or 9,000 people in West Africa “caregivers”? Kelly, that’s just one of MANY questions that should be brought up. Also — the CDC warned the Dallas hospital medical staff who had worked on the patient from Liberia against air travel. So, it’s not okay for them to fly within the U.S. but it’s perfectly fine, nothing to see here, if people from Ebola hot zones hop on a flight and come HERE? My head’s about to explode. It appears that the best treatment for Ebola is the blood of someone who survived the virus. Also, read about colloidal silver. It kills viruses , bacteria and fungus. Dont forget to wash the containers coming from the groceries. If a person sneezes, other people can walk through particles of that sneeze up to 15 minutes later. Sneezes contain saliva. Saliva is a bodily fluid. So don’t tell me that isn’t a form of airborne transmission. Another point, if it’s considered a ‘caregivers’ disease, aren’t we all caregivers? Hospital workers go home after work and care for families. Those families go off to school and work. Teachers care for students, sometimes ill students. I wasn’t mentioning the movie Contagion as blown out of proportion Hollywood hype. I mentioned it because it realistically shows how something can spread. If I grab the handrail on a bus or staircase, or the shopping cart, and the person right before me who grabbed it has just whipped sweat off his brow, or sneezed into his hand, well, you get the idea. We don’t need to panic or be afraid, we just need to be informed and aware. Wash your hands, stop touching your face, keep cuts or skin breaks covered, if you’re sick, keep your distance. The comments made by “Trish” are the craziest comments I have ever read! A “caregivers” disease? It is the general public that catches the disease and then is transmitted to the caregiver. There are too many people trying to tell all of us there is nothing to worry about, and then puts out these stupid articles and comments. Is this the same information you are telling the people in Africa? And the other diseases you mentioned. We now have those diseases and others on the rise in America as well. We do need to be concerned and be prepared. Besides your own personal protective gear, stopping an infection at the source is key if you are near an infected person. The sick person needs to keep their mouth covered with an N95/100 mask to prevent saliva from traveling to another person. If the sick person is delirious, their arms/hands should be restrained to prevent them from removing the mask. First, I believe in God, and He is my only hope in this scenario. 2:All governments lie to their people in order to control, or subdue. there is NO difference in this situation, our government IS lying to us. 3:Finally, someone has said that 21 days is NOT correct: the ebola virus CAN be dormant for as many (later admissions my also prove this timeframe wrong) as double that, or 42 days, so quarantining victims must be for much longer than 21 days. 4: We can be sure of no information being given to us by CDC or other agencies is correct, but rather downplaying the actual truth, and act accordingly. 5: My faith is in God, not man, and even though I will do all I can to help my family and myself against this situation, by being prepared as best I can, only He can protect all of us against such horrific statistics, and I trust in Him. Hand Sanitizer is effective as long as it is 70% ethyl alcohol. The WHO even suggests using hand sanitizer. Ebola is an enveloped virus which is a lot easier to kill than a non enveloped virus such as norovirus or poliovirus. The envelope is very susceptible to dessication, chemicals and heat. The only thing I don’t suggest is using the hand sanitizers that come from beauty supply stores where it is alcohol free or has a 40%. Alcohol free hand sanitizers do not kill bacteria on the hands. It is too slow of a kill so the bacteria and viruses have time to multiply before they die. Have you read the book “the bible code” and looked specifically for this disease? Quite interesting. 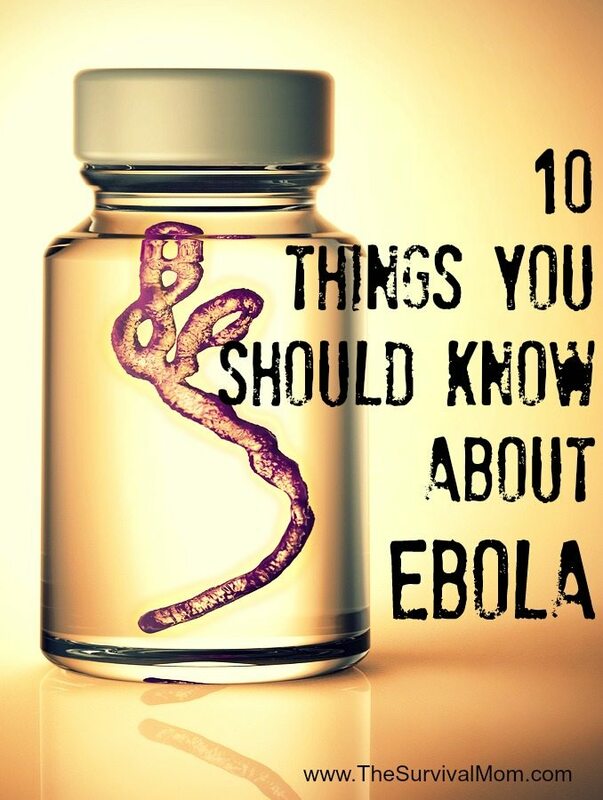 The article was titled ’10 Things You Should Know About Ebola’ but actually said nothing about Ebola!! !